Typically, Fridays are dress down for me which means nice jeans and a dress shirt. But today I had an event for work speaking to students that may be interested in our program so I had to dress to impress. In honor of the snow finally being off the ground and the temperatures climbing to 60, I busted out my kitten heels and wore them sock free today – YAY! It’s my favorite time of year. While I was walking to my car in order to move it and pack it up with materials, I was less than graceful. There is construction going on for a new building, and a lot of the asphalt is torn up. Well, there was huge chunk of asphalt lose that I didn’t see and stepped right on it which meant that, as I was wearing heels, I went down. And I went down hard. On both knees. Thankfully, I had put my hand out to steady myself so I ended up avoiding fracturing my ankle, but as I stood up and my eyes welled with tears, I was not only embarrassed (though thankfully no one noticed) but in pain. I finished walking to my car, moved it to the side entrance of my building, and went back up to my office before finally checking the damage. It was not too pretty, and my now wet pants (thank you rain and puddles) made my knees sting as I walked. As I drove to my event, though, I calmed down, my pants dried and you couldn’t even tell I had fallen. The event was AMAZING and I met so many interesting students. The minute I got home, though, I changed into sweatpants and hopped on the couch with icebags. Three hours of standing in heels with badly bruised knees = PAIN. 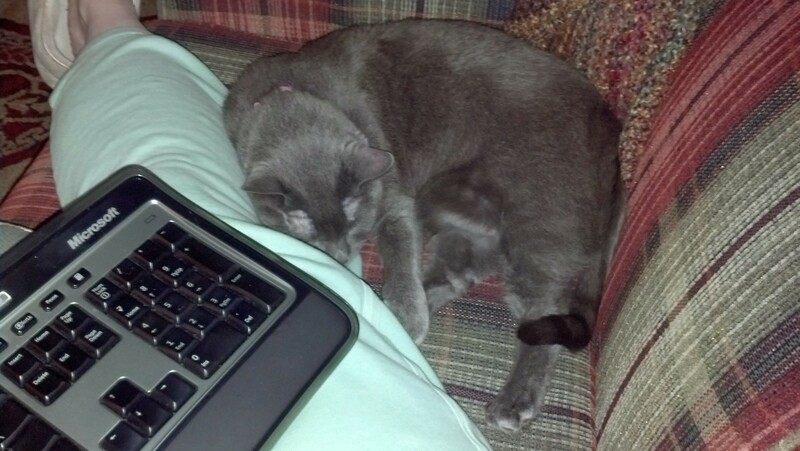 Now, if you’ve read this blog more than once, you probably know that Luna is my designated couch buddy. And she was quite confused why I kept shooing her every time she tried putting her head on my knees. 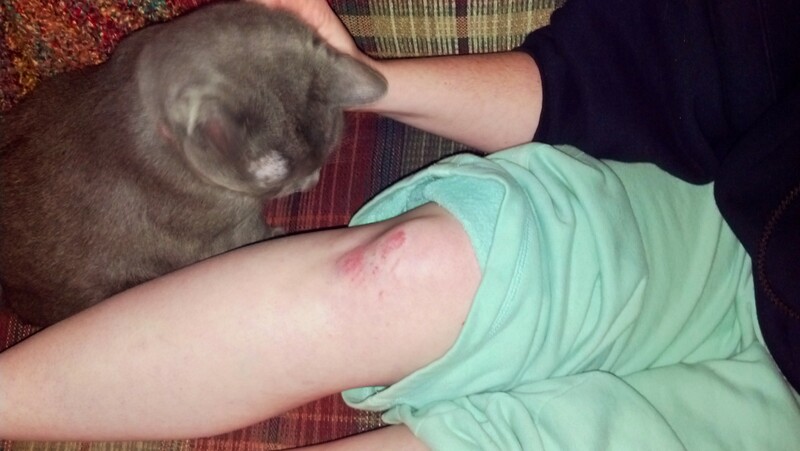 But, ever the kind kitty, she decided she needed to check out the wounds. This was right before she decided to lick it. And I’ll say that did NOT feel good. But soon enough she found a way to work around me and as I settled in to do some transcription, she found a comfy place to lay without being on my knees. 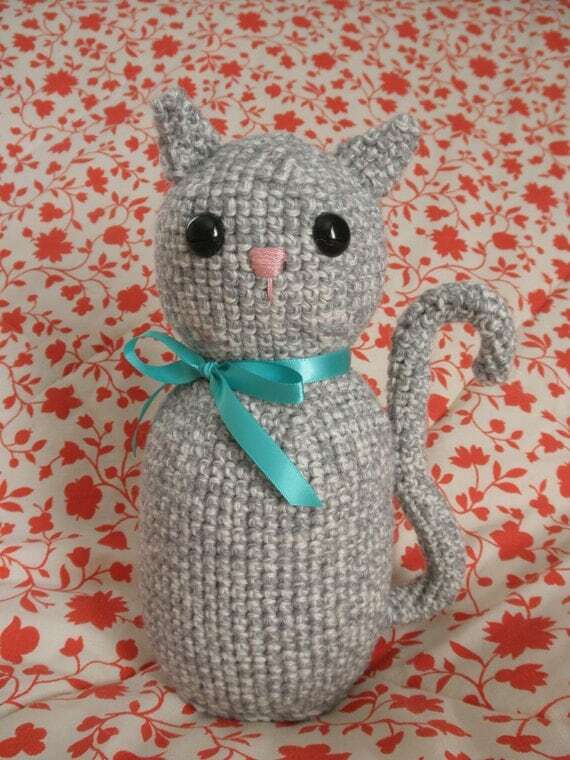 Hope everyone had a lovely and injury free feline friday!